For 1 to 2 dancers or guest. With live musician. Carolyn Carlson prefers to use the term “visual poetry” to “choreography”, while describing her work. She uses dance, writing and calligraphy as means of expressing poetry. She has been publishing poetry books for many years, Le Soi et le rien (Actes Sud 2002), Solo poèmes et encres (Alternatives 2003), Inanna (2007), Brins d’herbe (Actes Sud 2011), Dialogue avec Rothko (Invenit 2011), Traces d’encre (Actes Sud, 2013) and most recently Writings on water, from the name of the eponymous exhibition of her drawings and inks in Roubaix in the summer 2017 (Actes Sud, 2017). 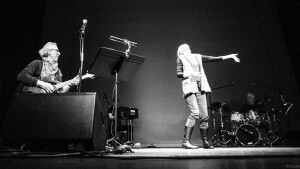 Carolyn Carlson developed a peculiar form over the past years, at the crossroads of these experiments, Poetry Events. Within a context of improvisation, dance, readings, visual arts and music are intermingled with snapshots from the choreographer’s imagination. 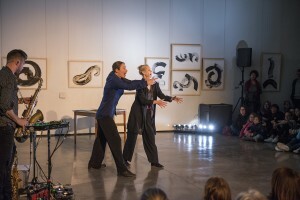 Each Poetry event is thought for a peculiar place and for some specific dancers; it is a unique event, a privileged moment inspired by a poetic expression of infinite freedom. Saxophonist Guillaume Perret is now a special collaborator of these “events”.